Kombu a C-shaped trumpet made of brass or copper is a wind instrument used in the state of Kerala in South India. The word 'Kombu' literally means horn in Malayalam and the instrument is shaped like a long curved horn. It was originally used in battlefields, weddings and religious processions in Kerala. Now this instrument is usually played along with other instruments for the instrumental music art forms of Kerala such as the Panchavadyam, Chenda melam, Pandi Melam, Panchari melam etc. Regarded as a rhythm instrument by its players, its function is to embellish the beats of the drums. The Kombu about 4 feet long consists of three brass/copper tubes fitted into one another. The end piece is connected by a rod or cord to give stability. The blowing end have a mouthpiece, and the end piece is spread out into a circular shaped flare, covering about 210 degrees of a circle of approx 60cm diameter with a slowly varying circular cross-section. The kombu is held vertically and can only produce three notes (sa, pa, and higher sa) because it has no holes or keys to produce different notes. It can be played in six 'thalams' or beats. There are two varieties of Kombu. The big kombu is usually called the timiri kombu and the other is called bari kombu. 'Kombupattu' is a solo performance played by a group of kombu players, usually in odd numbers of three, five, seven or nine. 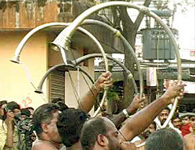 This music art form usually precede the 'Chenda melam' performance during Temple festivals. Kombupattu is lead by the kombu leader. The leader creates kombu patterns on the spot, within a given tala (rhythmic cycle) and this is repeated by the chorus players.